But building theories based on small pieces of evidence is not that scientific so in the absence of data that can be relied on, the meetings findings must be taken with a pinch of salt. One such statistic to emerge from the conference was that Ireland's racing fleet is 2000 active boats (including the ICRA cruiser nationals fleet) and 6000 active racers. The presentation of a project to standardise collection of data from classes by Sean Craig was very worthwhile and an important first step but it is clear that the advisory group charged with trying to make sense of the dwindling figures are still coming to terms with existing numbers in the sport. Craig's powerpoint presentation is available to download below. This was the first time, since its formation, that the group has met with the classes. This was the first of a number of proposed consultative meetings. The key themes were data collection (existing and future) and future development. Significantly, the meeting of dinghy class interests included members of the newly formed ISA Strategic Review Group who were no doubt interested in hearing about the numbers currently involved in dinghy sailing, a back bone of the sport in Ireland. The SRG has been formed specifically with the task of coming up with a new plan for Irish sailing and any future plan will include a means to boost flagging fleet numbers where it was largely agreed any class championships that currently has only 10 to 15 participants in not viable in the longer term. The DOKRAG considered that any Advice offered must be based on fact and looked at the available data, and ascertained what other data was necessary to make fully informed recommendations. Existing data of participation in National Championships was presented and analysed. (see slides) This data challenges the consensus that senior dinghy racing classes are in decline. This data is National Championships only (so no Water Wag or Howth 17 for example), excludes overseas visitors and is based on nominations for the ISA All-Ireland (ex Helmsmans) Sailing Championships. 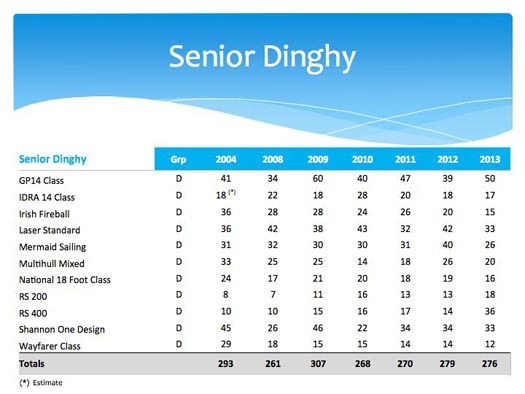 1/ Senior Dinghy classes are up 6% 2008-2013, although on a ten year view there is a 5% dip, due largely to falls in larger designs such as Wayfarer, Multihull and Fireball. "Traditional classes" (Mermaid, SOD, IDRA 14, Nat 18) are largely unchanged. There is continued strength in GP 14 and Laser and gradual increases in RS classes. 2/ Junior classes show a worrying 28% decline in the last 5 years, led by more "fun-oriented classes" like Feva, Topaz and now even Topper. Mirror appears to have consolidated well at lower levels and was, in fact, the second largest regatta by people in 2013. Numbers remain high in ISA Pathway single handers like Optimist and Laser, although the Optimist has seen a fall in the last 5 years. Single handers account for a very high 69% of all boats competing, in stark contrast to Senior dinghies where Double handers are 94%. 3/ Keelboat numbers show a downward drift in total but there is a negative skew from the explosive growth of the SB-20, which has fallen and is hopefully consolidating at the 20-25 boat level from 50+. Possibly more expensive and larger boat-types like Dragon, Etchells and even 1720 appear to be faring less well than smaller designs like the Squib and Flying Fifteen that continue to stage Championships with at or close to thirty boats. 4/ Cost is a probable causal factor for lower turnout given better performance by smaller boat types in each category. Cruiser/ICRA numbers, big decline in Learn to Sail/Small Boat Scheme numbers (down over 50% in 5 years), the fall in ISA membership (20% in 5 years) and, of course, the recession. 6/ Junior racing numbers appear, not surprisingly, to have been closely correlated with the numbers participating in the ISA Small boat training scheme with large increases in both 2004-2008 and sharp decreases in both thereafter. SSB 2012 certification numbers were still 5,200 and over 450 Instructor certification courses have been completed in the first 3 quarters of 2013 (up from just 160 in full-year 2005 for example). These are included in the analysis for possible relevance to overall racing population numbers. However, it was recognised that the number of those participating in National Championships is only a proportion of those regularly sailing in those classes. It is estimated that the number of regular, club sailors could be a multiple of 2 or 3 of these figures, with variations between classes. While this additional data is not currently available, it would be important if the true profile of dinghy/open keel sailing in Ireland is to be identified. This is best done through the classes. A draft template for such future data collection was shown to attendees, the template will be refined based on feedback, and then circulated to classes for completion. The aim is to get an accurate profile of age groups, gender, distribution of classes through various clubs, costs incurred, and racing opportunities and participation at a local level. Future Development of dinghy sailing was then considered,with active participation from delegates. The following had been identified as key issues, by the Group. a regular club sailor were discussed. 3. Transition from youth classes to senior classes was seen as a key issue, and needs more analysis. 4. A similar Consultation between DOKRAG and the Clubs will also be undertaken. 2. Consider a "Irish Student Sailing Championship" open to all registered students in Ireland. Those over 18 cannot participate in the Youth Nationals. While students can race in class events, such as laser, at club level, or in University Team Racing events, but there is a high attrition rate of sailors after 18. There is no large, multiple-fleet regatta aimed specifically at this age group. The concept was supported by those present and deserves further evaluation. 2. There is huge potential for attracting new sailors into the sport, particularly the twenty- and thirty-something's who may be moving from traditional team sports, into the burgeoning "adventure sport" arena. Marketing opportunities to attract this group into sailng.could be pursued. 3. A Dinghy Exhibition would give an opportunity for the general public, and those who have completed SBS schemes, to see/try all classes of dinghies, particularly if combined with an on-the-water experience. The concept was supported by those present and will be explored further.